Advent begins today. The color purple has an interesting background for us to ponder. Purple dye historically originated from a tiny shell-fish. It took 12,000 shell fish to make 1.5 grams of pure dye. The expense meant it was used only by the wealthy and became a symbol of royalty. Advent purple indicates we are waiting for the coming of the King of Kings. We are ‘preparing’ for the birth of Jesus but also spiritually for the second ‘coming’. Ponder for a few minutes what you would do if in 4 weeks time you were truly going to stand before Jesus Christ the King. Jeremiah was a prophet in a very difficult time. Jewish King after Jewish King had failed to bring peace. God’s people were now in exile in Babylon. In the midst of foreign people and their gods Jewish people began to lose hope. Jeremiah reminds them of a promise made by God to believe in: I will raise up a ‘just shoot’ from the line of David. So beautiful will this event be, the great city of Jerusalem will be renamed – Justice! In the midst of life’s difficulties what brings you hope? Frequently we think of God’s love, but do we recognise what God really wants is ‘justice’. Do you hope for this as a future event or do you give your life to its fulfillment ‘today’? Thessalonica was one of the earliest christian communities. A port city bringing trade and culture, hot springs bringing tourists. It was prime real estate in a Roman provincial town. With many cultures came many gods, Greek, Egyptian, Roman Emperor worship. Paul had been chased out of this town quickly but had established a small group of christian followers. He writes to encourage them to be blameless in holiness, living lives pleasing to God. Ready ‘for the coming of our Lord Jesus with all his holy ones’. Picture your own town instead of Thessalonica. What is the purpose of ‘conducting yourselves to please God’? Is it only for heaven or a sign for people ‘today’ of heaven? Year C begins with our move from the Gospel of Mark to the Gospel of Luke. Luke’s community is tired of waiting on a promise of Christ’s return. Luke gives instruction on how christians are to live while ‘waiting’. What does the image: ‘stand erect and raise your head’ mean to you. What would make you do this? 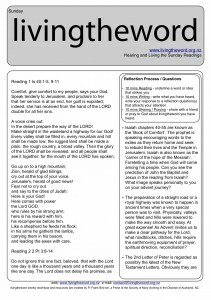 What does living in readiness ‘now’ actually look like for you? Luke contrasts people of the ‘world’ with hearts drowsy or hardened with excessive sensual pleasure, drunkenness, worries, with christian disciples watchful and vigilant, praying and ready to stand before the Son of Man. Where are you in this picture? What advent practices could you begin to be ‘vigilant’ ‘prayerful’ ‘ready’? What would you like to bring to God in the Advent practice of receiving the sacrament of reconciliation? We all know what December will involve: shopping, christmas cards, cooking, end of year celebrations. Will you be satisfied? How could you ‘slow down’ and set aside time to soak up the christian focus of Christmas – is there a church near or on the journey from work you could visit for 5 minutes daily?